Amaris Homes goes right to work saving energy and cutting waste with its Afton, Minn., project. Few builders are bold enough to offer even a one-year guarantee on their homes. 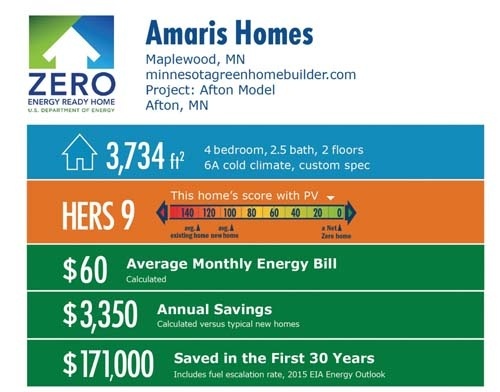 Raymond Pruban of Amaris Homes offered a 10-year guarantee on his model home in Afton, Minn., promising that it would be a net-zero-energy performer, producing as much energy as its occupants used each year, for a decade. What inspired such confidence? Pruban had made a commitment to certify all of his homes to the strict performance criteria of the U.S. Department of Energy’s Zero Energy Ready Home (ZERH) program and, since making that promise in 2013, the custom home builder had already certified 11 homes through the program. Amaris Homes met all DOE program criteria and included a 12.1-kW solar system on the model’s roof. The home had calculated energy savings of $4,500/year compared to a home built to the state code (the 2012 IECC) and achieved a Home Energy Rating System (HERS) score of 9. Even without the PV, the home would score a HERS 39, far below the 80 to 100 HERS score of typical new homes. The energy savings show: Despite a hard winter, the home’s February 2017 bill revealed a credit of $110.38. Homeowners can also use the surplus to power an electric car with the charging station in the garage. The high-performance home started with a highly efficient shell. The concrete foundation slab was wrapped in rigid foam with R-10 under the slab and R-15 hugging the slab edges. The exterior walls are constructed with 2-by-6 studs set 24 inches on center and aligned with the 24-inch on-center floor and roof trusses. On the exterior, the walls are sheathed with 7/16-inch OSB, then covered with a 1-inch layer (R-5.5) of rigid foam, which dramatically reduces thermal bridging, or the transfer of heat through the studs. The wall cavities were filled with R-21 of high-density spray foam, which combines with the exterior rigid foam for a total wall insulation value of R-26. This wall assembly eliminates condensation potential in the wall cavity in Minnesota’s cold climate (zone 6). Headers over doors and windows were constructed with a single ply of wood, rather than layers of solid wood, to allow space for closed-cell spray foam insulation. The exterior insulated sheathing is topped with housewrap that is taped at the seams and overlapped to provide a continuous weather-resistive barrier and drainage plane under the board-and-batten engineered wood and stone siding. All wood-to-wood seams in the walls and around windows and doors and the wood-to-concrete joints along the base of the walls are sealed with thick beads of caulk or adhesive to reduce air infiltration and seal out pests, dust and exterior allergens. Attics can be a major source of air leaks. The gaps around light fixtures, flues, heating ducts, vents, and between sheetrock and wall top plates can add up to one large hole. Amaris sealed all of these leaks at once by covering the entire ceiling deck with two inches of spray foam. They covered this with 12 inches of blown cellulose to increase the insulation value to R-65.5. The vaulted ceiling over the great room was insulated with R-49 of closed-cell spray foam. Before installing the spray foam, Amaris installed full-length air chutes (or baffles) along the underside of the roof to maintain a ventilation path in each truss bay from the soffit vents to the continuous ridge vent. The vaulted ceiling was spray foamed when the wall cavities were foamed, before the ceiling drywall was installed. Shorter air chutes were also installed at the eaves above the flat ceilings to provide a path for ventilation air and a “back stop” to keep insulation out of the soffit vents. The baffle-top plate juncture was sealed with spray foam when the rest of ceiling was foamed after the ceiling drywall was installed. A high-efficiency gas boiler provides hot water for the zoned radiant floor system as well as for faucets and showers. A high-efficiency heat pump provides zoned cooling. The roof decking was covered with ice-and-water shield to 36 inches above the vertical wall line, then topped with 15-lb asphalt-impregnated felt underlayment. All valleys were flashed with metal. Metal roof edging was installed at all exposed roof decking. Step flashing and kick-out flashing were installed at any house-wall intersections. The roof was topped with architectural asphalt shingles. Three-foot overhangs at the eaves provide shade and rain and snow protection for the walls and windows. The windows are double paned and vinyl framed with low-emissivity coatings and an insulating argon fill between the panes. They have a better-than-code insulating value of U-0.22 and a low solar heat gain coefficient (SHGC) of 0.21 to allow for more beneficial solar heat gain in this cold climate location. The extensive use of spray foam helped to create a tight house. Blower door testing, required in the DOE ZERH program, confirmed that the house had a whole-house air leakage rate of 1.1 air changes per hour at 50 pascals (ACH 50). To bring fresh air into the home, Amaris installed an energy recovery ventilator (ERV). The 80-cfm, 76-watt HRV brings in fresh air through an outside air intake that is ducted to the return side of the central air handler for the furnace. At the same time, the ERV exhausts stale air that is pulled from returns in each room of the home. The air ducts cross in a heat exchanger where heat is transferred from the warmer duct to the cooler duct, warming the incoming air in winter and cooling the incoming air in summer. The incoming air also passes through a high-filtration MERV 16 filter capable of removing particles as small as pollen, mold, dust, auto fumes, bacteria and smoke. The bathrooms have local ventilation with Energy Star-rated motion sensor-controlled exhaust fans. Amaris specifies low-VOC paints, stains and adhesives to help keep contaminants out of the house. The home is equipped with a highly efficient natural gas boiler (annual fuel utilization efficiency [AFUE] of 0.95) which supplies hot water for the in-floor hydronic heating and for domestic hot water. Cooling is provided by a two-stage air-source heat pump and distributed by an air handler with a variable-speed DC motor. The heat pump has a cooling efficiency (seasonal energy efficiency ratio (SEER) of 16.0 and a heating efficiency (heating season performance factor) of 9.8. All HVAC ductwork is rigid metal ducting that is sealed with an interior spray sealant. 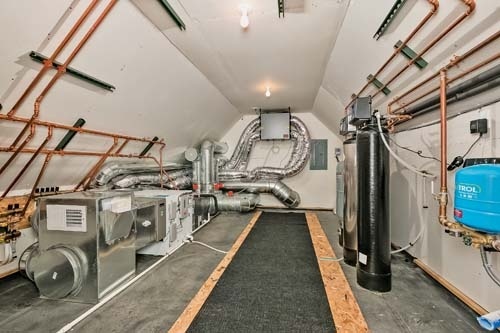 The ducts are located within the insulated, conditioned space of the home, as required by DOE ZERH. A mechanical room over the centrally located entry of the H-shaped home serves as the center point for four heating and cooling zones in the home’s left and right wings. 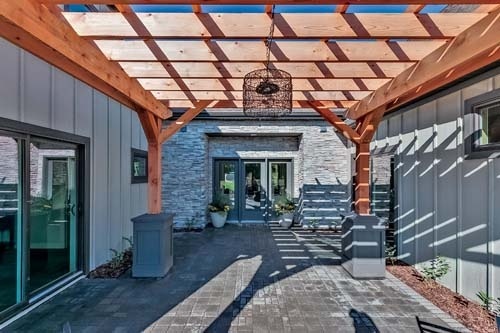 To ensure longer value to a homeowner, the builder added several aging-in-place features, such as wider doors and hallways, and zero-step entryways. While these energy-saving features are a financial plus for any homeowner, residents will find many other benefits thanks to the ZERH requirements and Amaris’s thoughtful design. The home meets all clean air and moisture management mandates of the EPA’s Indoor airPLUS program (a DOE ZERH requirement). This equates to lower indoor humidity, better filtration and ventilation, and fewer contaminants in the home. Pruban also added several aging-in-place features, like wider doors and hallways, zero-step entryways and a zero-step master shower. Because Minnesota experiences severe storms and even occasional tornadoes, Pruban took pains to strengthen the building envelope. Amaris uses let-in bracing and installs metal strapping every 48 inches along the exterior walls to secure roof, wall and floor framing to the foundations. Structural sheathing fasteners are attached every 3 inches along the edges of the sheets and every 6 inches in the field. The 3 inches of closed-cell spray foam used to insulate the exterior walls has been shown in testing to provide at least 200 percent additional shear (lateral) strength. Amaris also uses upgraded hold-downs and reinforced garage doors. The DOE homes have caught the attention of local media, and Amaris has been the subject of newspaper, magazine and web articles, and radio and TV news stories. The Afton home was featured in two Parade of Home events and received more than 2,000 visitors, with some coming from as far as 200 miles away. “Establishing these higher standards in our specifications has attracted sub-contractors who are intrigued by the idea of building something different and better,” says Pruban. “This has enabled us to take on higher dollar value projects with confidence.” Pruban notes that the company’s warranty costs have also gone down since the switch to high-performance construction. Walls: 2-by-6 24 inch o.c., R-21 closed-cell spray foam plus R-5.5 rigid foam over 7/16-inch plywood for R-26 total; housewrap, engineered wood siding. Roof: Ice-and-water shield 36 inches past wall line; 15# felt; metal valley, edge and step flashing; kick-out flashing; 3-foot overhangs at eaves; continuous ridge vent; vents and baffles in each truss bay; architectural asphalt shingles. Attic: Vented, raised-heel trusses; 2-inch closed-cell foam on ceiling deck for interior barrier plus 12-inch blown cellulose for R-65.5 total. R-49 closed-cell spray foam in vaulted ceilings. Foundation: Slab-on-grade, R-10 rigid exterior foam, R-10 rigid foam under slab. Windows: Double-pane, low-E, argon-filled, vinyl-framed, U=0.22; SHGC=0.21. Air Sealing: 1.10 ACH 50. Ventilation: ERV, motion-controlled exhaust fans. MERV 16 filter. HVAC: 0.95 AFUE gas boiler for in-floor radiant heat; 9.8 HSPF/16 SEER air-source heat pump with spray-sealed metal ducts in three zones. Hot Water: Gas boiler; super-insulated in-direct storage tank; recirc pump. Appliances: Energy Star refrigerator, dishwasher and three exhaust fans. Water Conservation: EPA WaterSense fixtures. Rainwater harvesting. Energy Management System: Smartphone PV tracking; thermostat and lighting controls. Other: One 240-volt quick charge electric car charging station in the garage. Low-VOC finishes. Wheelchair accessible; wider hallways and doors; zero-barrier shower. Metal ties roof to foundation.